By Justin James: In my neck of the woods, there is a myth that ranks up there with Bigfoot or the Holy Grail. 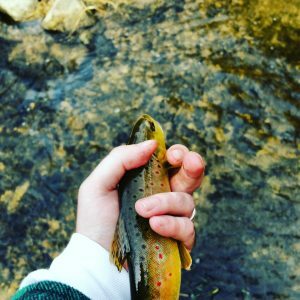 I’ve always heard of someone’s uncle catching brown trout from some mythical and little-known stream in northern Illinois. So I started doing a little research and narrowed it down to five possible bodies of water in my area. When I started trying to solve this mystery I felt like a private investigator from the 1920’s instead of wearing a trench coat and carrying a pistol I trade the trench coat for a pair of waders and a fly rod. I went through old newspaper articles at the library dating all the way back to the 1950’s. I started to find clues. So it was time put boots on the ground and get my fly line wet. When I found a public access point and started to walk down the trail it’s like walking back in time. Going through old orchards of the old homestead of the past that time has forgotten. Seeing no trash and no line up in trees made me think I was in the right place. The water was crystal clear and cold. I tied on a molted sculpin woolie bugger that I tied myself. I begin to cast and dead drift the fly on the second drift my line went tight and my heart was thumping. 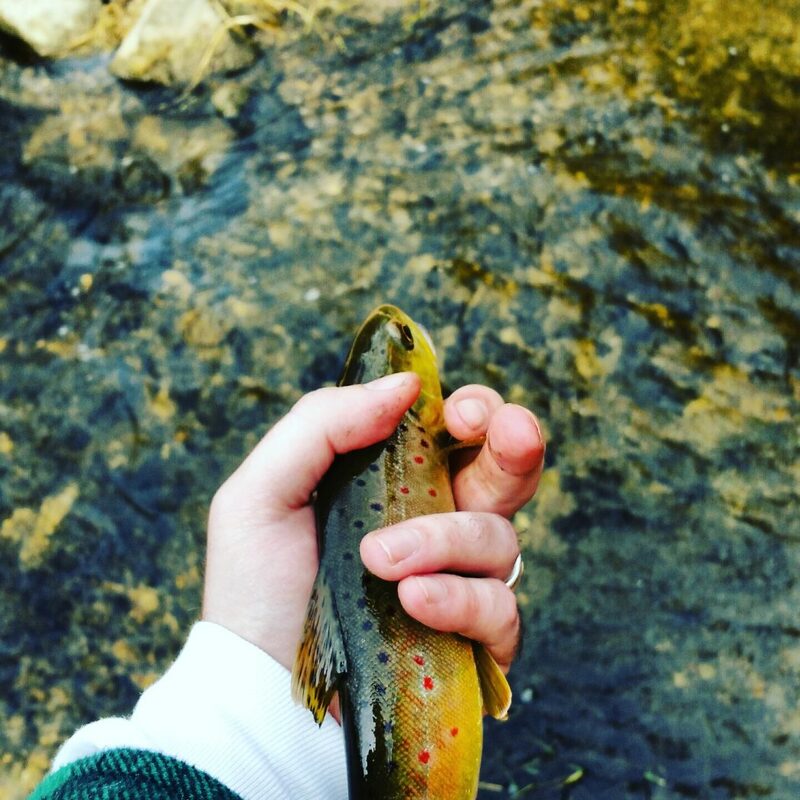 When I brought the fish to hand a saw the magnificent colors on the fish I knew I found what I was looking for. This fish looked like an ancient artifact incrusted with precious stones. As my good friend Jeremy scooped this 9-inch brown up in my landing net he said he’s never seen a fish this beautiful. 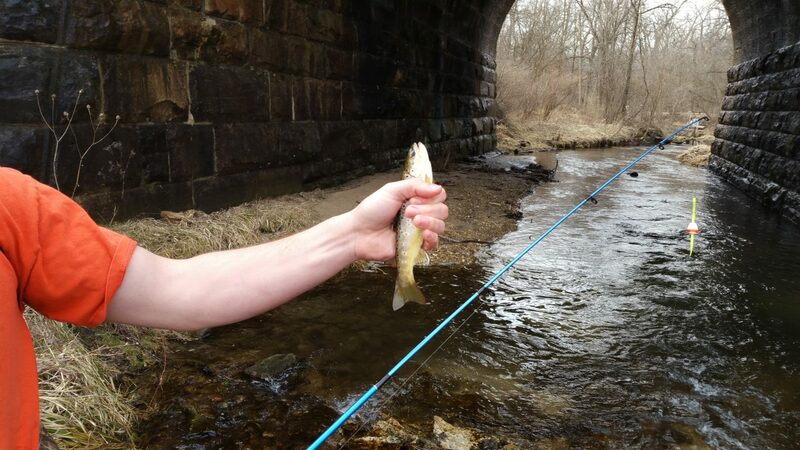 On that day we caught seven browns all together I got two on the fly rod and Jeremy caught the rest on good old big reds under a small float the biggest was 11 inches. On our walk out we were very thankful for the long walk out and wondered how many people have been over this little creek and never took the time to see what a wonder it is I’m sort of glad this place is not easy to get to and off the beaten path. We have not returned to this magical place I don’t know why it’s always on my list. Some secrets are better kept so if you have a legend in your neck of the woods it might be worth solving.